Desktop publishing is the process of using the computer and specific types of software to combine text and graphics to produce documents such as newsletters, brochures, books, etc. Both Macintosh and PC platforms are is acceptable. Industry standard software is available for both the Macintosh and PC. Page layout is the process of placing and arranging text and graphics on the page to produce documents such as newsletters, brochures, books, etc. Page layout refers to the actual document page and its composition. The primary software programs for desktop publishing are called page layout applications. Vector graphics are mathematically based. All lines, shapes, etc. (also called objects) of a vector-based image are independent of one another. Vector-based images are usually created and edited in “drawing” or “illustration” programs such as Adobe Illustrator. Vector-based images have smooth edges and are created with curves or shapes. Vector-based images are best for precise illustrations, but are not as good for photorealistic images. Vector-based images are easily scalable due to their use of mathematic formulas. They will print at the maximum resolution of the imaging device. Bitmap images, also referred to as raster images, are pixel-based. This means that location and color information about the image is stored in individual pixels within a grid. Figure A shows a small blue arrow image at its actual size. Figure B shows the same image magnified. The upper left quadrant shows the individual pixels of the image. Each pixel has an assigned color; some pixels are white, while other pixels are blue. The information stored in a bitmap image regarding pixel location and color is what forms the image. Bitmap images are edited at the pixel level; in other words, the color of any one pixel can be changed. Bitmap images are usually created and edited in "photo" or "paint" programs such as Adobe Photoshop. Bitmap images are mapped to a grid. The size of the image is based on the image's resolution. Bitmap images will reduce in quality when printed larger than their optimal resolution. Bitmap images are used for photorealistic images and can have complex color variations. Client submits digital file on a CD or the preferred upload through our website. During the prepress process your files are first of all copied to our servers. Your file gets a preflight review. A press-optimized PDF is created. We’ve learned that by streamlining the prepress process we are able to pass significant savings on to our customers. Press Optimized PDF is refined. Refining is the process of turning your graphic design into information that the RIP (Raster Image Processor) can understand and image on a printing plate. Trapping involves creating a region of overlap between two adjacent colors, so that even if the colors are a little out of register, no gap is visible. In the illustration below you can see how trapping helps this problem. Imposing is the positioning of pages on a press sheet in such a manner that when the sheet is folded into a signature and cut, the pages will be in the proper sequence. After the imposition is processed, a preview is created to make sure that everything is in proper position for the printing plates. An imposition proof is made to show position of copy, pictures and position of pages. A contract color proof shows how CMYK colors will print. Client approves both these proofs. If a change is required the process goes back to making the change in the digital file. Depending on the type of change, new proofs may be required. A PDF soft proof is often used for reviewing changes on screen. Once all proofs are approved, plates are made. A prepress checklist lets us bypass common pitfalls associated with preparing digital files for print. Run spell check as part of the page layout procedure. Have higher authority review low resolution PDF. Have a second set of eyes proofread your document. All raster images (color or grayscale) should be 300 dpi (dots per inch) at final size in the page layout. If a 4"x6" 300 dpi image is enlarged to 10"x12", the effective resolution is only 150 dpi. The image will look soft when printed. 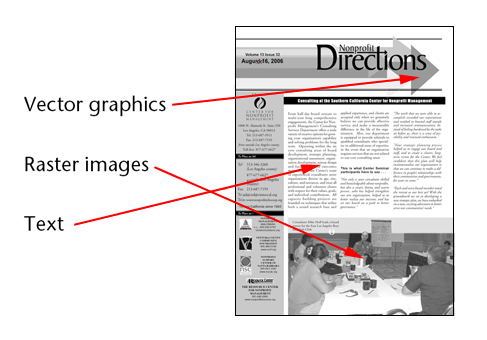 When using InDesign page layout software, the effective resolution for an image is shown in the Links panel in the Link Info section. Effective resolution should be at least 300 dpi. Line art is a high-contrast graphic image made of a single color. The effective resolution for line art should be at least 1200 dpi. RGB (Red, Green, Blue): The primary colors of light are the colors your monitor uses. Differing percentages of each color make up all the colors you see displayed. CMYK (Cyan, Magenta, Yellow, Black): These are the primary ink colors used for four-color process printing. Differing percentages of each ink make up the colors you see printed. When RGB is converted to CMYK, the color can change because fewer colors can be made from CMYK. Color shifts are usually not obvious in color photographs; however, briliant and solid colors (like a background) can be affected by the color conversion. For regular body text, do not use Rich Black. For headlines larger than 48 points consider using Rich Black. 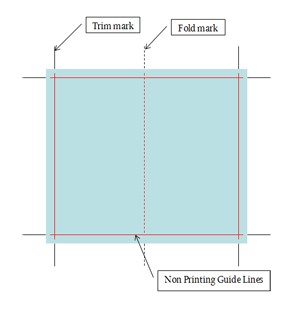 The document page size should be built to final trim size plus 0.125" (1/8 inch) bleed. Score, fold and trim marks are indicated and outside live print area. All fonts should be included when sending your project to the printer. Images should be linked to your document, not embedded. Embedding makes your file size very large. All linked images should be included when sending your project to the printer. The name of your image must be exactly the same as name of image place holder in your file. If your project requires a spot varnish, foil, embossing or diecutting, these items should be indicated in your document as spot colors. When you have checked everything off the checklist, collect all your files. This includes your page layout file, all fonts and images. When using InDesign you can select File > Package; to collect all your files. Submitting your project as a press ready PDF saves prepress processing cost. Including original documents with your PDF is helpful when we need to make changes for you. It is a good idea to collect your files into a folder and .zip compress it. This keeps file size down and makes for a single file upload. On a Mac, right-click or control-click the folder and select "Compress..." On a Windows PC, right-click the folder and select "Send to compressed (zipped) folder." For smaller files you can send email attachments. For larger files you can upload your files on the website. Ask about our FTP server if you would like to access via FTP.